Bond markets in the fourth quarter experienced a significant amount of volatility as investors attempted to gauge the extent of further Federal Reserve tightening and the likelihood of an economic slowdown as we move into 2019. 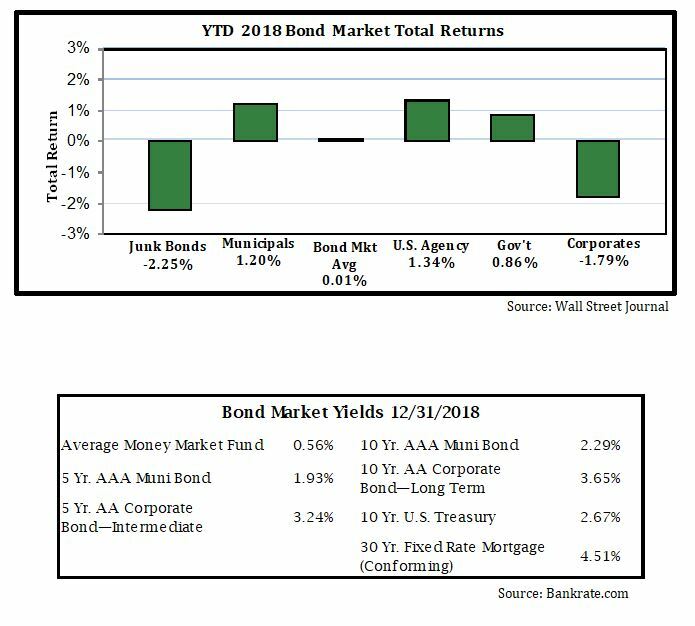 For the full year, the broad US bond market return was flat while yields vacillated dramatically in the final months of the year. The benchmark 10-year Treasury began the fourth quarter yielding 3.05% and quickly shot up to a high of 3.24% on November 8th before plummeting to 2.69% on December 31st. The Fed continued with its tightening campaign, raising short-term interest rates another 0.25% on December 19th to a range of 2.25-2.50%, despite unprecedented criticism from President Trump. Meanwhile, the yield curve continued to flatten and market pundits fretted about the possibility of a recession developing in 2019 or 2020. As of this writing, the spread (or difference) between 10-year Treasury yields and 2-year Treasury yields stands at 21 basis points (0.21%) versus a spread of 54 basis points (0.54%) at the beginning of 2018. Many in the press have noted that every recession since World War II has been preceded by an inverted yield curve which occurs when short-term interest rates are higher than long-term interest rates. In early December, the yield on the 5-year Treasury dipped below the yield on the 2-year Treasury, causing everyone to panic that the rest of the curve would imminently invert. However, it is important to note that not every inverted yield curve has resulted in an economic recession. For example, in 1998, 5-year yields dipped below 2-year yields but the rest of the curve di not follow suit. And no recession developed. From our perspective, the flattening of the yield curve indicates the general expectation that economic growth will slow in 2019. This should not come as a surprise given the strong growth we experienced in 2018 – much of which was helped by substantial fiscal stimulus (the tax cuts). But this alone doesn’t guarantee we’ll see a recession. Nonetheless, given the uncertainty of the current economic picture, we believe the prudent approach is to maintain our long-held stance in 3 to 6-year maturities and a continued focus on high-quality bonds.